Claire first discovered her aspiration at a young age: starting her own skincare line. Having graduated from the Singapore Management University with a degree in Business Management, Claire inherited her penchant for entrepreneurship from her father Boyd Au – a successful businessman and ex-CEO of listed firm, Enzer with 30 years of experience under his belt. 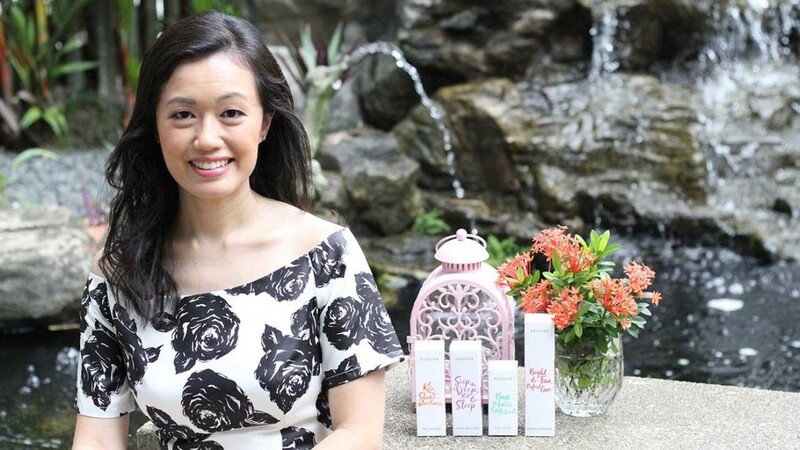 Auolive is a Swiss-formulated, Singapore skincare brand powered by natural ingredients, designed to help busy LadyBosses trim the daily beauty routine down to just one or two products that can also provide a multitude of skincare benefits. Auolive products are also great for the travelling LadyBosses! LadyBoss spoke to Claire on the brand, Auolive! Q: Tell us about more about the brand, Auolive! A: Auolive empowers women with a simplified skincare routine to have beautiful skin in just two minutes a day. Auolive does the multi-tasking, so that busy, multi-hatting women can hack the traditional multi-step skincare regimen. They can catch more sleep, will be in less of a rush especially in the mornings and most of all, they do not have to sacrifice pampering their skin. Why spend 30-45 minutes a day when you can have good glowing skin with just one minute in the day and one minute at night with Auolive? "Why spend 30-45 minutes a day when you can have good glowing skin with just one minute in the day and one minute at night with Auolive?" Q: What was the inspiration behind Auolive? A: When I was a little girl, I watched my mum spend time applying layers of creams and lotions on her face, and wondered to myself if that is the only way to have beautiful skin? It took time and mum was always in a rush in the mornings before heading off to work. I grew up knowing the 3-step routine as the Holy Grail- Cleanse, Tone, Moisturise. But over time, the number of steps grew more and more to include serum, pre-essence and lotion, essence etc. I felt that skincare was getting more confusing, overwhelming and too time-consuming right from the time of deciding what to buy. And when I spoke to women, I discovered most felt the same way too! I had a girlfriend who used to religiously carry out a 10-step skincare regimen, and after she gave birth, it became zero! When I was running my F&B business, I was like my girlfriend who did not use any skincare products as I was too tired! Those times, I recall my friends asking me why I looked so “chui” (haggard in Hokkien). After selling my F&B business, I went back to the corporate world. At that point in time, I was preparing for marriage, and I knew that when I enter the next stage in life of parenthood, I’ll be very busy juggling motherhood and business. There had to be a faster and more efficient way, and hence I came up with Auolive to save women time and money. Q: What were you doing before Auolive? A: I had my own F&B business and also worked in the corporate world in the skincare and luxury market. It was my dream to have my own beauty brand since young, and I’m thankful for the journey of working for others and starting my own business from scratch which helped me build up invaluable experience- it came in very handy in launching Auolive. "In the past, I’ll pack 6-8 skincare products when I travel and put them in a ziplock bag in case they leak, but now I only need 3-4!" Q: What are the trends you see in skincare and where are your products developed and made? A: We see a strong emphasis towards natural products formulated without parabens, colour, sulphates and mineral oil, and are not tested on animals, and that was how we formulated Auolive so that customers have a peace of mind knowing that they are safe for use. As people get busier, travel more and are more time-starved, they need a skincare solution that caters to their needs. Hence our time-saving, multi-functional products take care of that. In the past, I’ll pack 6-8 skincare products when I travel and put them in a ziplock bag in case they leak, but now I only need 3-4! At Auolive, we use twist-cap airless bottles which are spill- and leak-proof, perfect for travelling. You do not need to worry about losing the bottle cap when you travel too! Auolive skincare products are water-based, Swiss-formulated with natural active ingredients and made in Singapore. They are dermatologically and clinically tested by an independent 3rd-party laboratory which is used by the big names in the skincare industry. Q: What were the challenges you faced starting Auolive? A: At the beginning, we had to balance quality of the products and wanting to launch in the shortest time possible. It took us a longer time to perfect the products not only its efficacy but also the texture- the touch and feel. As a user of skincare, we know women are put off by oily residue or a sticky feel when using products e.g. sunblock. Hence, we worked with the lab to ensure our products are easily absorbed, e.g. the Day Glower- our day cream absorbs almost immediately and does not leave a sticky and oily feel especially when outdoors. Also as a new brand, we needed to build and earn customers’ trust. Hence every step we took, we did it to build trust. Example, we sent our products to be dermatologically and clinically tested by an external third-party laboratory, which was used by the big names in the skincare industry, so that customers know Auolive products are safe. "Also as a new brand, we needed to build and earn customers’ trust. Hence every step we took, we did it to build trust." Anti-ageing ingredients tend to age very fast, so we’ve invested in top quality Korean airless bottles, which prevents contamination and keeps the product ingredients in its optimum condition. There is also the general misconception that multi-functional products are not as effective as standalone ones. Frankly, we thought so too. So, we did our homework and worked with dermatologists and cosmetic scientists to ensure this idea of combining multiple products into one bottle with the same efficacy wasn’t just nice-to-have. We needed it to be effective and to work hard for your skin. When we had the reassurance, we had our products intelligently formulated in Switzerland to combine multiple benefits and functions in one bottle. That way, our customers can outsmart the traditional multi-step skincare system and enjoy effective and efficient skincare in a bottle, saving them time and money. Q: Who are you thankful for your success? A: I have very strong family support which helps me juggle both roles as a mother and business owner. In particular, my dad who has been my mentor and rolemodel in business, giving me great support as he has always believed in me. He’s a founder and owner of a listed company and a very established businessman, and I’m very thankful he takes time to guide me. Q: What motivates you personally? A: When I did my research before launching the brand, I found that Auolive’s multifunctional products resonated with a lot of women – some were confused and overwhelmed with all the options out there; some were simply too tired to put any skincare; most just wanted a simple, pared-down routine. It is now my mission to find all these women because I’m very excited to share with them about our fuss-free and simple routine, which gives them great skin! Q: What are your hopes for local women entrepreneurs? A: A Singapore Business Review article dated 8 March 2017, stated that Singapore is amongst the best countries for women entrepreneurs. However, “even with a strong showing in support infrastructure for entrepreneurship, Singapore demonstrates a comparatively low percentage of women business owners in the segment”. Local women can be thankful that they do not have to struggle against cultural biases that undermine their path to entrepreneurship/leadership. It is therefore my hope that we can leverage on these and have more female entrepreneurs on board. A: Simple and effective in which you can have pampered and beautiful skin in just two minutes a day.